Dimensions: 36" x 3 1/2" x 26". 120 Lbs. Made with recycled plastic slats. Shatter proof clear plastic sheet. Posts are made from solid 4" x 4" recycled boards. 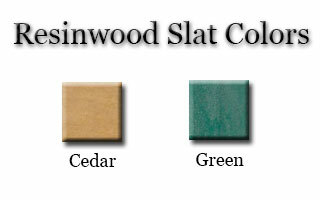 Available in green and cedar. Available in inground or with surface mounted posts. 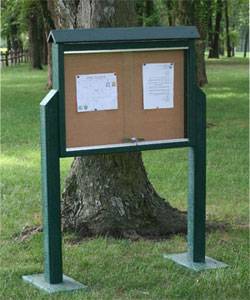 Post important messages at your park or workplace with our Jayhawk Plastics industry-standard message centers. Our medium sized message centers can be purchased one or two sided and are made from various size resin wood slats with a shatter resistant clear plastic sheet. Marine grade cork will secure your messages along with a specially coded locking mechanism. 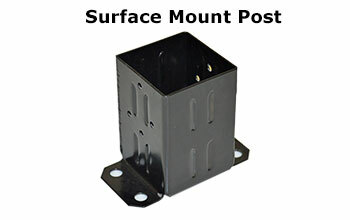 Mounted posts are made from solid 4" x 4" resin wood boards. Comes with a 5 year commercial warranty! Best of all...Made in the USA! Call or email National Outdoor Furniture today for a quick quote!